3396 xeF Germany - extensive collection in 11 Lindner ring binder. As well French zone well-staffed, allied occupation / American/British Zone, Soviet Zone strong be present including good souvenir sheets, as well the bridge building souvenir sheet used with photo certificate, an extensive part German Demokratic Republik (East Germany), as well Berlin including monetary sovenier sheet with special cancel expertized Schlegel BPP. Please have a look! 3403A /⊙/ Germany - rich collection the post-war issues in four albums accommodated. As well numerous issues Soviet Zone / German Demokratic Republik (East Germany) including Marx souvenir sheet, Federal Republic of Germany with beginning valued, American/British Zone, an extensive part Berlin including black- and red overprint and so on. Please have a look! 1069 GIBRALTAR - 1960 / 98, nice mint never hinged collection complete in the KABE album with mounts with all special stamps, souvenir sheets, lovely subject issues and so on. High subscription price! 1192 GIBRALTAR - 1973 / 2004, complete collection unused in the Schaubek album with all special stamps, all novelties and so on. High subscription price! 2162 /⊙ GIBRALTAR - 1974 / 2003, rich collection souvenir sheets in the ring binder, parallel mint never hinged and used collected. As well numerous nice motives, popular issues and so on. Favorable! 1317 Grandee COMORE - 1897 / 1912, complete clean mint collection, all stamps wonderful fresh colors on Yvert hingeless printed form. 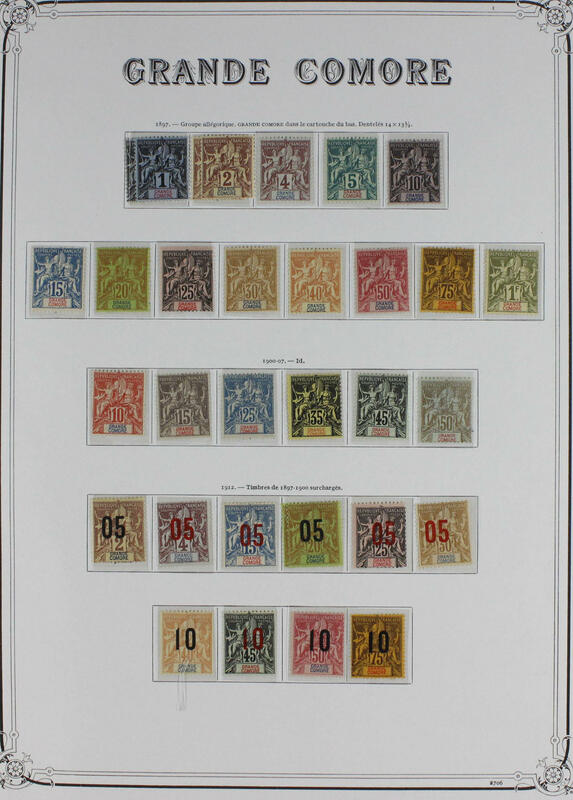 Also the postage stamps set 1897, as well also the issue of 1900 and the overprint items. A beautiful object! 18H Great Britain / nominal - nice inventory from post valid mint never hinged issues, all in bags, with also many lovely motives. The pure face value amounts exactly 700,- Pfd. 333 ✉ Great Britain - extensive lot of approximate 350 covers and First Day Cover packed in a carton. Many nice documents, decorative frankings, complete sets and so on. A delightful lot! 364 ⊙/ / Great Britain / British colonies - interesting lot in two large stock books, many various areas, older issues and so on. Including Australia, Papua New Guinea, Australian areas and so on. Very high catalog value! 378 Great Britain - clean mint never hinged lot in a large stockbook with numerous post valid values, many complete sets, beautiful subjects, souvenir sheets and so on. 413 /FDC Great Britain - Smiler miniature sheet 2000 / 01, in each case mint never hinged and on First Day Cover. High trade value! 570 ⊙ 1 Great Britain / colonies - rich collection, almost exclusively used collected in four large stock books. As well Great Britain extensively present from Michel no. 1 with many older issues, Shilling values, numerous special- and commemorative issues, furthermore also an extensive part Australia, much Malta with older values and so on. Enormous catalog value! 601 ⊙ 1 Great Britain - 1840 / 1967, extensive used collection in the Lighthouse illustrated album from Michel no. 1 formed, with numerous older issues, slightly mixed condition, with many superb and extremely fine copies, better values, Shilling values, special- and commemorative issues and so on. Very high catalog value! 602 Great Britain - 1968 / 95, very nice mint never hinged collection, except for very few values complete in two Lindner hingeless illustrated ringbinder with special- and commemorative sets, beautiful subjects and so on. High post price respectively catalogue value! 603 Great Britain / se-tenants - 1968 / 95, extensive mint never hinged collection different se-tenants and stamp booklet panes in two Lindner ring binder with horizontal and vertical combinations, addditinal imprints and so on. Very high catalog value! 682 x Great Britain - extensive lot on stock cards and so on. Packed in a carton. With also numerous older issues from the classic, Shilling values, postal valid issues and so on. Treasure trove! 752 FDC Great Britain - extensive lot of illustrated First Day Cover from the sixties and seventies years in the box, as well numerous special- and commemorative sets, nice motives and so on. Very high catalog value!